Book A Trip To Vegas Stat! Love donuts? Love Vegas? Looking to get married? Then book a flight to Vegas NOW! For Valentines Day Dunkin’ Donuts has partnered with a Las Vegas wedding chapel and will be throwing the first 100 people who get married at that Chapel on February 15 a free donut themed wedding complete with a glorious donut boquet! Even if the marriage doesn’t work out, at least you know it had a sweet beginning! I love stories like these. We are surrounded by so much negativity on a daily basis that it can be easy to start feeling like everyone is only looking out for themselves. This is why I like to share these types of amazing stories with you. So we’re reminded of the good people all around us and hopefully be inspired to help someone out today as well. An elderly couple stopped at a gas station when the woman’s legs started to give out on her. Her husband who is 100-years-old got out of his car when he saw his wife struggling with his walker and tried to help her. He was not able to get her into the car and that’s when three men, none of them knew each other or the couple all sprang into action to help! Not only did they catch the woman as she was falling and got her into the car safely, but they also helped her husband. A police officer saw the whole thing and wanted to share the sweet video of these men helping. Are we really that lazy to need a snack container that we strap to us? Have they actually sold any of these? 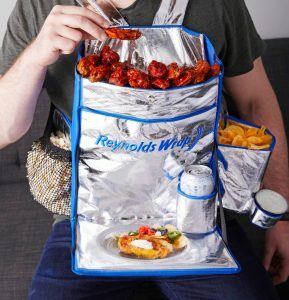 The answer to the first question is it’s the latest thing from Reynolds Wrap, a human feedbag that lets you have enough snacks to sit still for hours at a time. And the answer to the last question….are people actually buying this, yes in fact they are and the item is already sold out! It sold for $5 and more are being made because it was such a huge hit. As for the other two questions, I still don’t understand why this is a thing and I’m guessing some people really are that lazy to actually need one these. If you see one being used at a Super Bowl party, please let me know. I have never served in any branch of the military, to be honest I am too scared and weak to do so. I couldn’t handle it if we had to go to war and I had to fight, I also couldn’t handle the emotional/mental toll of the training involved. I have such respect for people who serve or have served our country. So stories like this, let’s just say they make me cry a little and also fill my heart with love and hope when I see how many people care about others and those who serve. 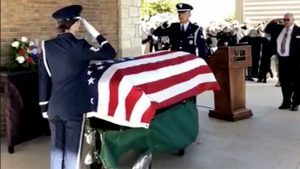 Todays feel good story of the day is about a 72-year-old veteran who was in the Air Force 1964-1968 and he passed away in Austin Texas. This mans family arranged for a funeral, then could not be reached. The Texas State Veterans Cemetery did not want this veteran to have a funeral where no one attended, so they put out a plea on Facebook. That simple plea resulted in 5,000-6,000 cars lining up to get into the cemetery to pay their respects and watch this man be laid to rest.